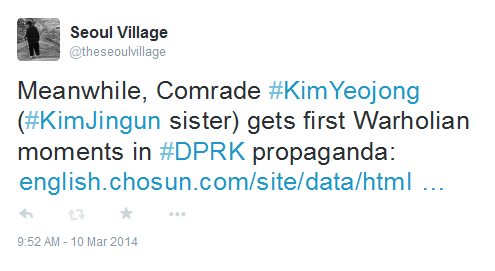 We've been flooded with interesting Baekduology updates regarding the women surrounding KIM Jong-un lately - and even before his 40-day 'ankle-management' hiatus (to which we'll return later). KJU's ex: HYON Song-wol reappeared last May on local TV, proving that reports of her death were an exaggeration, and suggesting that rumors of her involvement in debauched videos were probably not that trustworthy either. 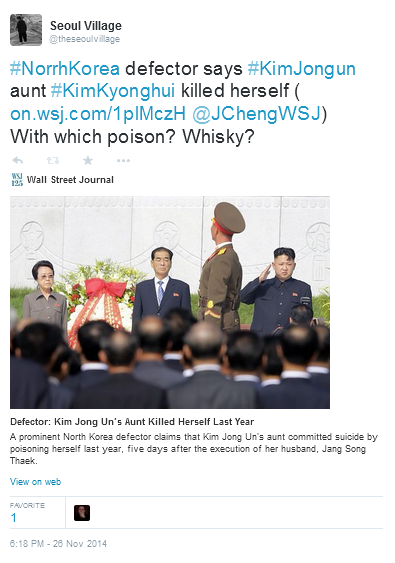 KJU's aunt: a defector says that KIM Kyong-hui committed suicide shortly after the execution of her husband JANG Sung-taek. Her poison: whisky, as usual? 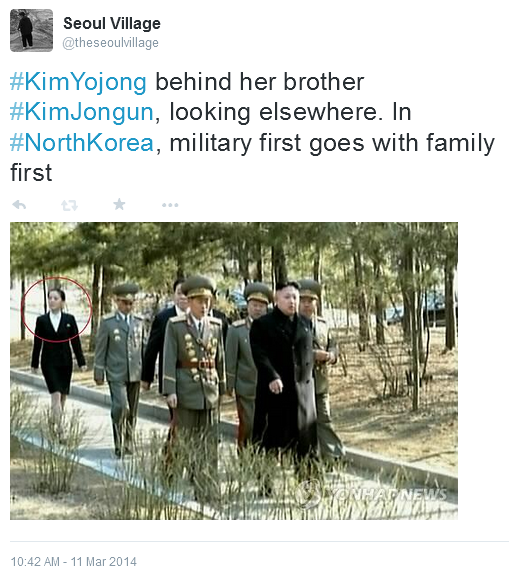 KJU's wife: RI Sol-ju is not as visible as she used to. 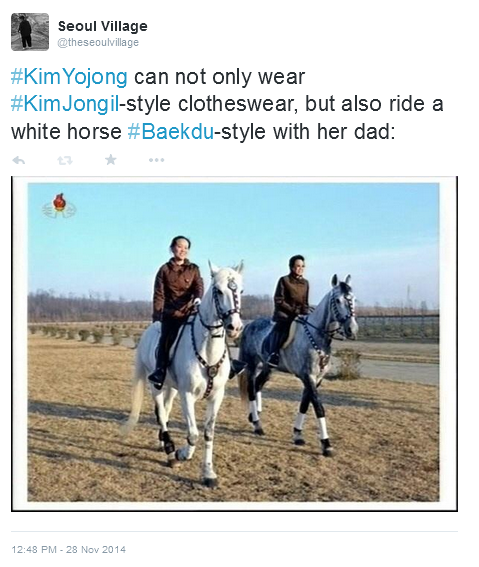 Maybe her bling-bling outfits contrast too much with lil' sis' Yo-jong's vintage Baekduwear. Anyway, in this family, giving birth to a potential heir doesn't guarantee anything for the future. 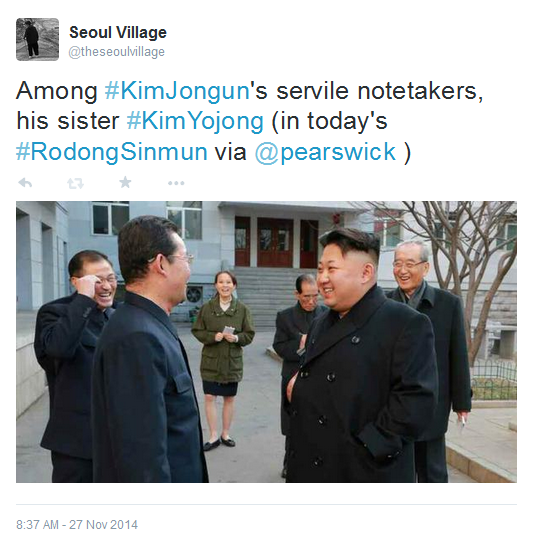 KJU's daughter: 2 year-old KIM Ju-ae is too small to ride a white horse, hold a notebook, or even study in Switzerland. 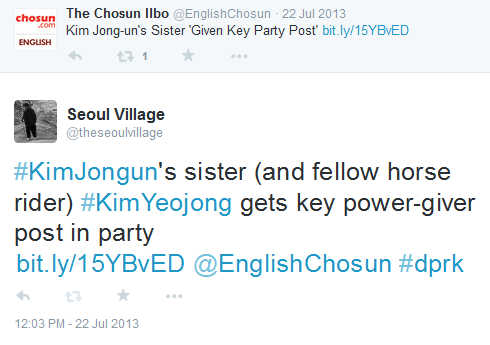 KJU's sister: when KIM Jong-un was under media radar, rumors had it KIM Yo-jong was running the show. 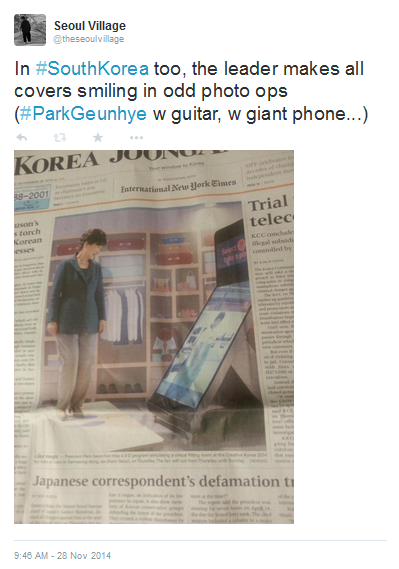 She's got the Baekdu bloodline and even the Baekdu clothesline. Newly wed, enjoying new prestigious jobs, and a lot of attention from the propaganda, lil' sis' seems to have become more than just the most politically correct female figure to exhibit these days. 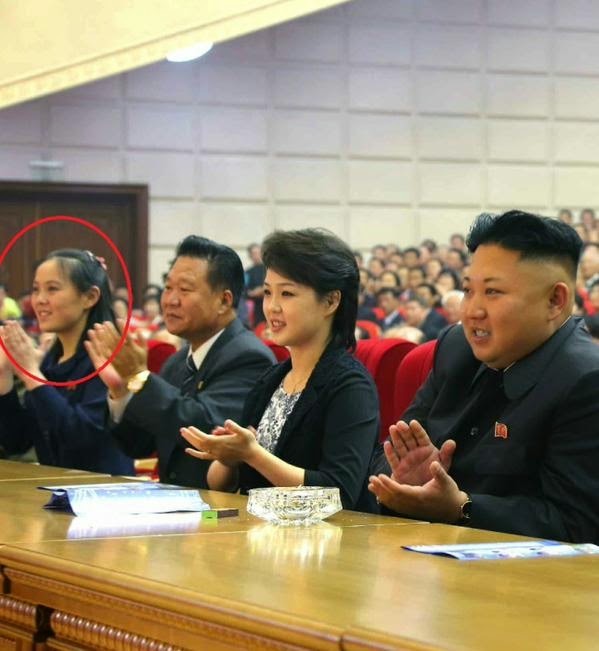 So is KIM Yo-jong the next Dear Leader or just a Cheer Leader? 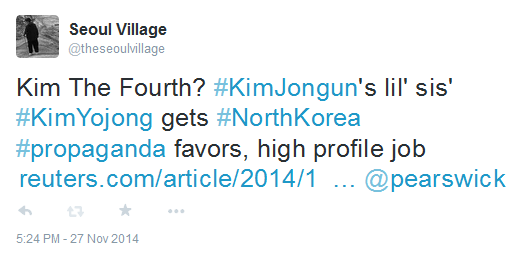 Kim The Fourth or Jang The Second? Let's unhearth a few tweets and links. 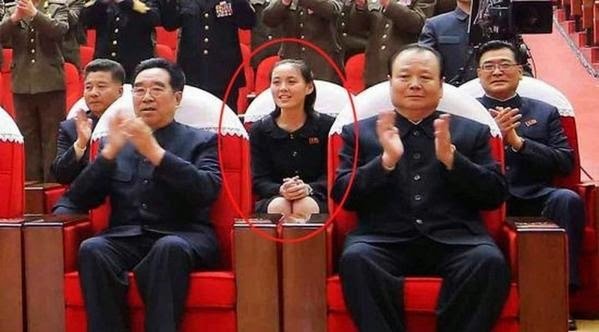 KIM Jo-young the next Dear Leader of just a Cheer Leader? 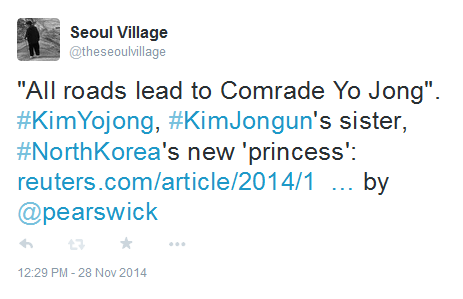 KIM Yo-jong's rise mechanically helps Kim The Third become Kim The Elder, a father figure. Not just that isolated brat who got his uncle and aunt removed, not just the potential last ruler of the dynasty. 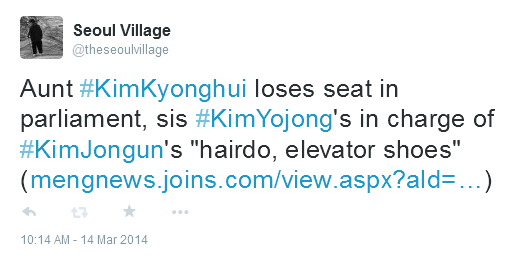 At this stage, KYJ is not portrayed as a next-in-line. 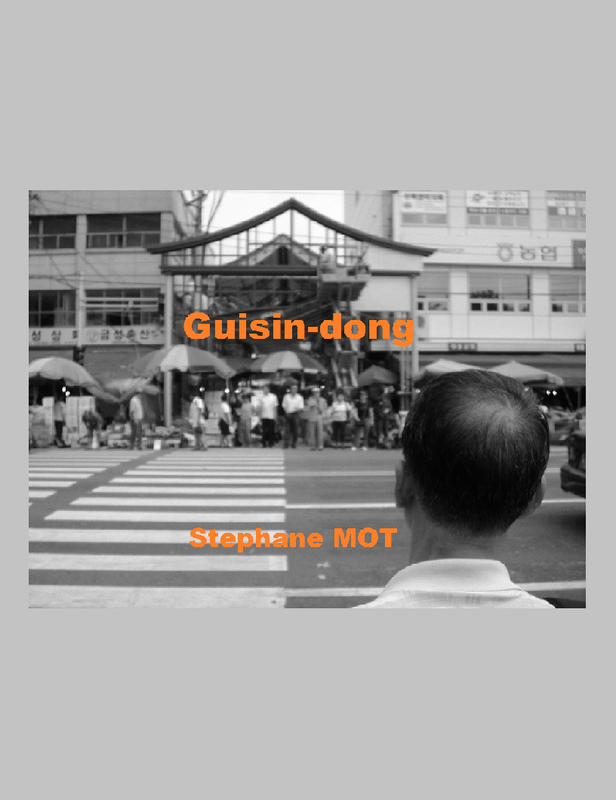 She's in the background, trailing behind, more cheerleading than leading. But at least she's in the picture, unlike poor bro KIM Jong-chul, who anyway has never been the one wearing the trousers in this litter of baby dictators (or holding Uncle Jang at gunpoint?). 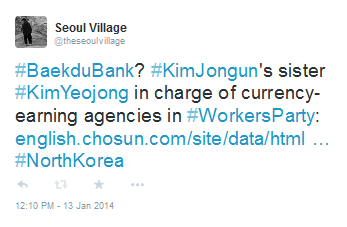 KIM Jo-young: Kim The Fourth of Jang The Second? KJY conveniently fills many shoes at the same time: aunt Kyong-hui is gone? 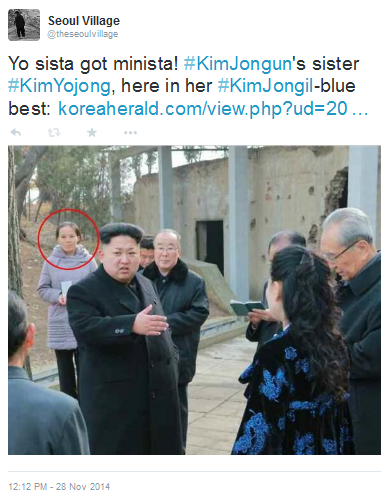 here's a new female, blue-blood presence - uncle Jang is out? here's someone more trustable who can take care of cash machines. 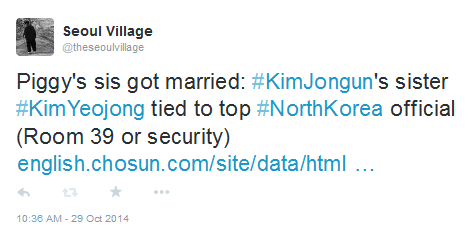 And she's married to authorities, party friendly... If these guys cut a whole branch of the family tree, they made sure the main one filled the gap.